This month many of our Deer Canyon roads are highlighted with blue edges. The abundant wildflower responsible for what might appear to be purple breakdown lanes is called Dakota vervain. Other common names for this plant include Western pink vervain, prairie vervain, Mexican vervain, fernleaf verbena, fern verbena, small-flowered verbena, and Dakota mock vervain. The abundance of common names in this case might suggest that there really is some value in the precision of botanical nomenclature. Glandularia bipinnatifida may be a mouthful, but it does clearly designate one specific plant (or does it? See “The Botanical View” below). Glandularia derives from the Latin word glandula, which means a small acorn-shaped gland, a reference to the shape of the fruits. The epithet bipinnatifida, indicating one of the 8 different species of the genus Glandularia found in New Mexico, describes a plant with twice-divided, or “feathery” leaves. The Dakota vervain is a perennial plant that belongs to the verbena family (Verbenaceae). Although most of the 1,035 species of this family (worldwide) are herbaceous or shrubby plants, probably the best known and certainly the most economically important member of the family is the Southeast Asian timber tree that yields teak wood. Dakota vervain is commonly found in open, dry habitats, and particularly in places where the soil has been disturbed. Its stems are square in cross section and covered with stiff hairs. The branching stems often spread out over the ground and turn upright to bear flower clusters. Leaves have an opposite arrangement on the stem and are highly dissected. They have sunken veins and hairs that lie flat on the leaf surface. Dakota vervain has a long flowering period (March to October) with the flowers occurring in rounded clusters 6-12 inches off the ground. The five petals of each flower are partially fused to form a tube that contains nectar and accommodates butterfly pollination. The free ends of the petals are notched and spread into a star shape ranging in color from pink to violet. Small glandular hairs cover the green bracts and fused sepals found at the base of each flower. The fruits are small nutlets. The names vervain and verbena are essentially synonymous. 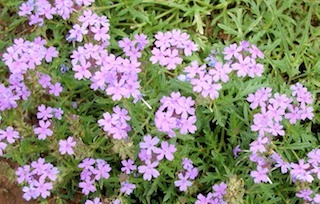 Verbena is a Latin word that refers to leafy twigs used to make wreaths that have ritual and/or medicinal applications. 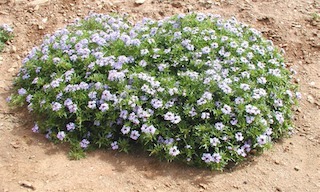 There are records suggesting that the Acoma and Laguna Indians crushed the leaves of Dakota vervain to rub on snakebites and also made an infusion from the leaves to gargle for sore throats. The traditional Spanish name for this colorful and widespread plant is Moradilla meaning “little purple one,” a particularly fitting description for this plant that decorates our roadsides and much of the rest of our landscape for over six months every year. A Botanical View – How can one plant have so many names? It is not surprising that the same plant often has more than one common name. There are no rules for the establishment of such names, indeed anyone is free to call any plant whatever name they deem appropriate. Sometimes the name sticks and others find it useful as well. However as we have seen in the case of the Dakota vervain, frequently many such names are in use at the same time by different groups of people. As long as the different groups do not need to communicate with each other, or if they do some imprecision is both expected and tolerable, no problems arise. A scientist, however, must be able to refer to a specific organism in a way that has precise meaning to any other scientist anywhere in the world. Consequently there are rules governing the establishment of scientific names for organisms. Therefore Glandularia bipinnatifida will mean the same species of plant to any botanist anywhere. The system usually works, but sometimes there is a legitimate need to change or revise scientific names. Verbena bipinnatifida and Verbena ambrosifolia are both proper scientific names for the same plant as Glandularia bipinnatifida. How can this be? The same species may be discovered independently by two different scientists at two different times and/or in two different parts of the world. This may result in two different names for the same species especially if one or both of the scientists involved was unable to complete a thorough review of all previous relevant literature (in all languages). Usually another scientist interested in similar plants comes along at a later time and turns up the discrepancy resolving it by announcing the earliest properly proposed name as the official one. However the other name does not necessarily immediately disappear. Perhaps more commonly today, new information about one or more previously named species arises (often based on DNA analyses) necessitating a reinterpretation of proposed evolutionary relationships. What were assumed to be two different species may be merged into one or vice versa. Sometimes, as was probably the case with Verbena bipinnatifida, a genus that might contain 30 different species will be reevaluated based on new evidence and split into two genera. Perhaps the original genus will keep 20 of the species with their names unchanged, but the other 10 will be found to be fundamentally different in some way that necessitates the creation of a new genus (such as Glandularia). 1 - The Audubon Society Field Guide to North American Wildflowers – Western Region by Richard Spellenberg, Eighth printing, 1988. 2 – Plants for Natural Gardens by Judith Phillips, 1995. 3 – Central New Mexico Gardens: A Native Plant Selection Guide by Carolyn Dodson & Peggy Wells, 2005. To download a pdf of this essay, click here.